Chinese ginger supplies are expected to be tight this year as the country’s growers turn away from the crop and cold weather delays shipments, according to supplier I Love Produce. 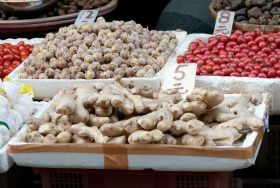 While no official statistics are maintained on the Chinese ginger crop, I Love Produce’s Chinese office has estimated production area declined around 20 per cent for the crop now entering the market, with a drop in yield of 10-15 per cent. Ginger prices on the Chinese market have increased about 50 per cent over the last three weeks, according to the company’s president Jim Provost, who attributes the rise to the smaller crop and cold weather. Provost said poor prices for Chinese ginger over the last two years have turned farmers away from the crop. Unusually cold weather in Shandong – below freezing for much of the past month – has also meant growers haven’t been able to carry out the ginger washing, drying and curing process. “Until temperatures warm up, exports will be light, and there will be a gap in supply from mid-January to possibly the end of February,” I Love Produce said in a statement. The company expects Chinese ginger prices to continue to rise in the short term on the back of the shortage, also pushed by increased demand as Chinese New Year approaches on 10 February. Prices will likely stay high over the course of the year. “I would recommend retailers lock in ads for ginger early as supplies will be tight in February,” said Provost. I Love Produce is a US-based sourcing and marketing company specialising in garlic, ginger and onions.